Maybe you have been out of the office for a week or you’re so swamped with work that you allowed messages to pile up. In any case you will feel—and be—more confident and in control when you can see the bottom of your email inbox on one screen. Start with a clean slate. For extreme cases, when the number of messages exceeds 500, move every message older than this week to a new folder. Then deal with the recent messages and new messages as they come in. Commit time on your calendar to using the steps below so you will clear the message backlog that you moved. Develop a system. Decide which messages you must keep and which you can delete. Check your organization’s policies on record keeping for guidance. Create folders not only in your email program but also in your document files. Just because information originates as email doesn’t mean you must keep it that way. You can convert an email message to a task, an appointment or a document. Apply rules. Creating rules to automatically filter messages is a great tool, and you can apply a rule to the messages in your inbox as soon as you create it. So if you notice that you have a number of messages that meet the same criteria, such as e-letters that you can move to a “To Read” folder, set up that rule and apply it now. Reply to minimize. As you work through the messages, analyze the patterns so you can head off email overload in the future. Ask people to remove you from distribution lists. Tell people when they don’t need to email you or should contact someone else. Train your staff to use common subject lines so that everyone can apply email rules to their messages. Be ruthless. Often email builds up because we delay making a decision. Force yourself to act on email, and delete often. If you can’t shake the fear that you just might need a message, move it to a “Kill after hold” folder that you clean monthly. Now savor the feeling of a clear inbox, and don’t allow bad habits to fill it again. This product is designed specifically with the busy manager in mind. Not only will you learn how to manage your own time, but this product also provides you with all the resources necessary to train your staff to be more efficient. And you know that in this do-more-with-less business enviornment, time management skills are critical. 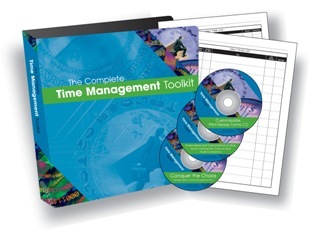 The Complete Time Management Toolkit teaches you and your staff how to improve your productivity and efficiency and do more in less time—all in an easy-to-understand, step-by-step process. You’ll learn to overcome typical time traps and wasters and find the best practices to follow. But best of all, it provides you with a detailed process and all the handouts you need to conduct a successful, thourough and memorable training session. This budget-friendly product is designed to save you the time of developing your own training session—and it teaches you and your employees how to manage your time more effectively. The 21-minute video Conquer the Chaos: The Best Ideas in Time Management. The 60-minute tip-filled audio program Overworked and Overwhelmed at Work: Tips for Calming the Chaos at Work. A 34-page workbook stuffed full of best practices, guides, tips, quizzes and more. A CD with dozens of customizable, print-ready forms. This entry was posted in The Organized Executive's Priority One and tagged Email, Organization, Productivity, Stress, Time management. Bookmark the permalink.